In his latest book entitled “To the Margins”, Professor Riccardi picks up on the agenda set by Pope Francis, which he already pursued in his home city of Buenos Aires and now continues into his Pontificate – venturing beyond the comfort zone within the Church to the fringes in need of the Gospel. Riccardi talks insistently about the outskirts, be they geographical or human existence on the margins of society. The bastions of the wealthy alongside city slums relegate the less fortunate to the margins in both geographical and human terms. On a global level, entire continents are ostracised, as in the case of Africa. Riccardi has coined the term “geothology” to describe Pope Francis’ maxim of reaching out to people on the outskirts. As far as the churches are concerned, Riccardi says that they have distanced themselves from the people both structurally, by means of their territorial principle and administrative units, and in gradually cutting themselves off from the proletariat (since the industrial revolution, at the latest). He maintains that religious life must (once again) be shaped by congregations on the outskirts, in the same way that Jesus moved from the margins into the centre of focus. 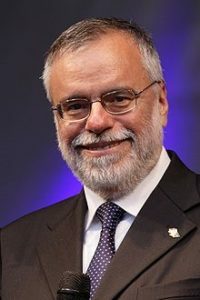 Professor Andrea Riccardi (born in Rome in 1950) founded the Community of Sant’Egidio, which teaches the Gospel, serves the poor and promotes peace in many countries. Together with the Waldensian Church, a member of the CPCE attending the General Assembly in Basle, Sant’Egidio runs Italy’s official “human corridor” scheme aimed at ensuring refugees’ safe arrival in Europe. Riccardi is a Professor of Contemporary History at Roma Tre University and President of the Dante Alighieri Society. He has been awarded numerous accolades, including the Charlemagne Prize in 2009. This is a public lecture. Media representatives and anyone from the member churches interested in any of these topics are warmly invited to contact the “faces” directly for further information about the texts. The press officer at the head office, Ingrid Monjencs, would also be happy to arrange interviews (mobile: +43 699 18878 052, email: presse@leuenberg.eu).